So, who has had some sort of home emergency in their home before? Most of us would fall victim to some sort of home emergency, and the longer we live in our homes the greater the chance of something happening. Whether it was a burst water pipe, a broken down boiler (which always seems to happen on the coldest day of the year!) or rain damage and water coming in through your roof and ceiling! Well we have fallen foul of the dreaded home emergency in the past. However, ours was most definitely NOT self-inflicted…..! Boilers have always seemed to be the bane of our lives and things always go wrong with them even with the regular servicing that they require. If they weren’t such an essential part of modern living I’d get rid of ours but sadly that’s not going to happen! Only a few years ago we’d got through the summer and everything was fine until the temperature started to drop and shivers from the children (plus me as well!) prompted the heating to go on. Thermostat was turned up expecting the toasty glow from the radiators but all we were greeted with was….. absolutely nothing! Hubby was on a night shift, so he was asleep, which left me trying to find a boiler engineer who could come out that day and repair it for us. It wasn’t an easy task, as well as very costly. I wished then we had Home Emergency cover as I could have easily called someone out to repair it for us. Knowing who to call – Using tradesmen that have been recommended and a number to call when in a panic. Overnight accommodation – If your house becomes inhabitable, some covers will provide you with overnight accommodation to stay in. Peace of mind – Knowing that you have that cover if something does go wrong. Cost – Home emergencies can be costly and unexpected, your cover can be much cheaper than a home emergency. 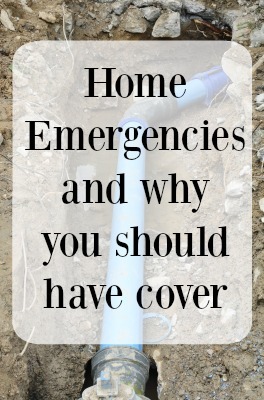 So have you had any home emergencies that you wish you had cover for? Or are you already organised and have cover in place, and if so have you used it? A little bit organized! I know a plumber who helped us before! I know a busy carpenter! Hubby can do electrical emergencies. But sometimes I consider having an insurance behind.